Pantheon Enterprises manufactures a variety of high-performance industrial and consumer products that are non-hazardous, non-flammable, non-corrosive, environmentally safe and consciously created. The products are available under Pantheon brands and for private label. Surface Pretreatments A variety of non-chromated surface preparation, adhesion promotion and corrosion-inhibiting products utilizing safe, hazard-free processes for a variety of surfaces and applications. Including PreKote® these technologies offer off-the-chart adhesion, improved paint flexibility and superior corrosion protection for painted surfaces. Metalworking Fluids Pantheon sells a variety of lubricants in the industrial and consumer markets. MetLube® Metalworking Fluid is a multi-machine, multi-application breakthrough. It is the only heavy-duty metalworking fluid that offers a leap forward in machining performance, operational cost savings, and health and safety. Industrial Cleaners High-performance industrial cleaners sold under the X-IT® brand provide safe solutions for tough challenges including ink, paint, grease, oil, tar, carbon and more. These products are scientifically designed to work aggressively and have applications in industries ranging from manufacturing, marine and aerospace to hospitality and automotive. We also sell specialty weapon care cleaners under several brand names including M-Pro 7®, Hoppes No 9 and Hoppes Elite. 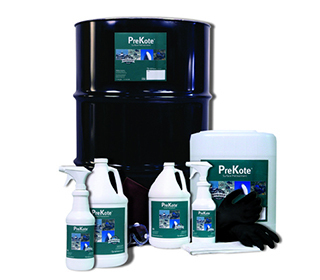 PreKote® is used on metal and composite substrates prior to priming and painting aircraft. PreKote offers superior paint adhesion and flexibility, while providing advanced corrosion protection. MetLube® Metal Working Fluid was built to outperform other metalworking fluids across a wide range of applications - even cutting oils. It is the next generation in metalworking fluids. X-IT®Aerospace Cleaners are non-toxic, non-corrosive, non-hazardous, odorless, aqueous-based cleaners and degreasers powerful enough for difficult applications, but safe enough for routine cleaning and maintenance. Designed for use on all surfaces(rubber, plastic, metal, painted or unpainted), X-IT Aerospace Cleaners quickly remove unwanted carbon, dirt, grease, grime and oil.